Commemorate the historic win with the 2018 Panini Philadelphia Eagles Super Bowl Team Set. 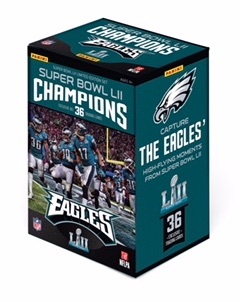 Honoring the Super Bowl LII Champions, the factory box set highlights the biggest moments from the big game. The hard part is over for the Eagles and their fans. Now they can just sit back and enjoy it. For many collectors this means obtaining large amounts of Philadelphia Eagles Super Bowl Champions memorabilia. While impressive, some of those pieces can also get quite expensive. On the other hand, the 2018 Panini Philadelphia Eagles Super Bowl Team Set boxes are very affordable, with suggested pricing of around $30. Inside the NFL-licensed blaster box, 36 cards tell the story of a thrilling title victory, led by quarterback Nick Foles, over the New England Patriots and Tom Brady. Because these factory sets come complete, there is no need to worry about tracking down missing cards in the set. Given that they are relatively inexpensive, they also can be a great gift. Panini actually got an early start on the Super Bowl cards for the Eagles with their Panini Instant NFL line.